My wife and I have lived in our house for a little over a year now. I remember everyone telling us that we had an apple tree in our backyard, but last year nothing grew on it. Wow, was this year different. This thing was packed to the brim with apples! I’m still not entirely sure what type of apples these were, but they fit the look and description of Bramely apples, so that’s what I’m going with. The apples were pretty tart, but still edible right off of the tree. I used a couple pounds of diced up apples with my Saison, Farmhouse Disco, but that left a ton of apples that I needed to use. I decided to do a 3 gallon batch of cider. I credit Yooper on homebrewtalk.com for the way I made this cider. I didn’t have an apple press or juicer, so I needed a way to extract the fermentables from these apples. I diced up a ton of them and then froze them in big freezer bags for a few days. 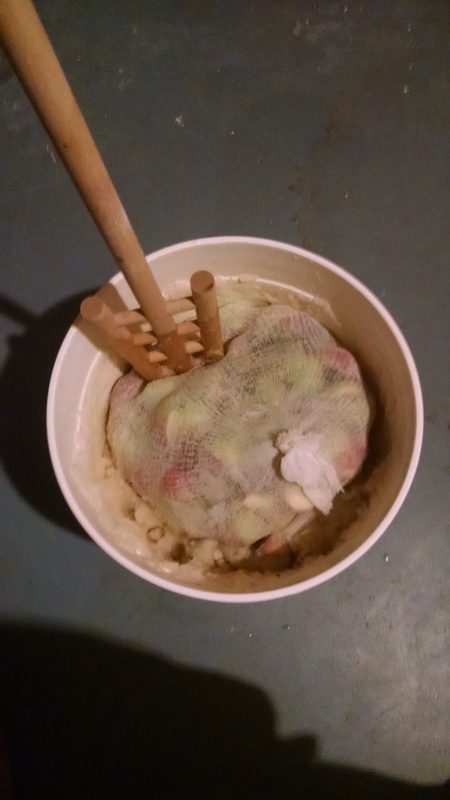 I then put the apples into big mesh grain bags and put them in a big plastic bucket. I sprinkled a ground up campden tablet on there, and then added some pectic enzyme. I left that until the apples began to thaw and then I used my mash paddle to smash them as much as I could. I did this several times over the course of the day until the apples were as pulpy as I could get them. I then sprinkled a pack of Safale S 04 yeast over that and sealed up the bucket for about 5 days. The usual sanitation practices apply. 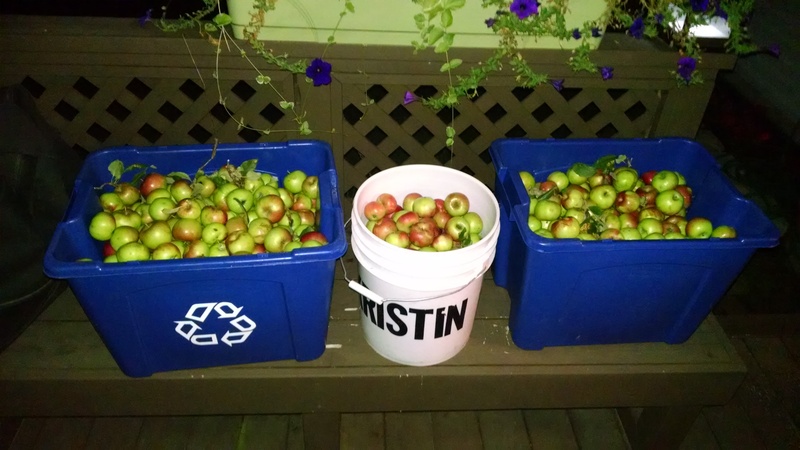 Next, I sanitized my hands and grabbed each mesh bag of apples and squeezed every last bit of juice that I could out of them before discarding them. Like I said, I got about three gallons of cider from this method. It was pretty labor intensive, but fun to say that I did this completely from scratch with my own apples. I added a bit more enzyme to help clear it, and then fermented that for about another week. The OG of the juice was 1.044. I then racked to my 3 gallon better bottle and let that sit for another month or so until it cleared. The cider finished at 1.002. It had some nice flavor at bottling, but I’ve read that cider takes a while to come into its own. I bottled that up and am awaiting the result! I’ll post tasting notes when the cider is good to go. This was my first cider, and it may be my last. The tree in my backyard had to come down unfortunately. My back yard is slopped downward pretty steeply, and this tree was planted on that slope. It’s had a lean since we’ve been here, but when it became full of fruit, the lean got worse. When had a bad storm one night late summer, and the tree’s roots began coming out. It was apparent that this tree had to come down. This cider from it’s fruit will hopefully be a fitting tribute to it! Appearance: This cider pours straw colored and crystal clear with a thin lingering white head. A very nice looking cider. Smell: Pretty strong aroma on this that reminds me of champagne with a bit of cider like funk to it. The aroma is pretty pleasing. Taste: Meh. The cider is on the bland side with a bit of tartness. The initial flavor is there and it’s nice, but it quickly fades and the aftertaste is a bit funky. Its not like I can’t get through a glass, its just kind of boring. Mouthfeel: Bubbly and light. Pretty standard for a dry cider. Overall: This cider is just ok. I didn’t have super high expectations given that most ciders use several varieties of apples to get a more complex flavor. I’m sure there are things I could have done as far as post fermentation additives to improve this, but I have no idea what I’m doing with ciders….and to be honest, I didn’t feel like diving too deeply into it. It was a fun little thing to do with the ton of apples I had and this is drinkable, so I’ll live with a somewhat bland result. Update: 06/09/16: I wound up drain pouring the rest of this. Time in the bottle wasn’t helping. There flavors weren’t developing in a pleasant way, so this cider was put out of its misery. This entry was posted in Recipes by White Pointer Brewery. Bookmark the permalink.